Long before Lilly, Tory and Kate, there was Vera. ♥ The brand’s namesake creator, Vera Neumann (née Salaff), was born in 1907 in Stamford, Connecticut. Bolstered by her parents encouragement, she pursued her passion—drawing and painting—getting formal training at The Cooper Union for the Advancement of Science and Art and the Traphagen School of Design. ♥ In 1938, she met and married George Neumann, who had a background in textiles. They moved into a small NYC apartment and together started a company, Printex, that merged textiles and art. They built a small silkscreen press to fit on their dining room table which was only large enough to produce linen placemats, which they cured in their oven. Cute! The power couple hired a sales guy, who nabbed them their first deal—1,500 placemats for B. Altman Department Store. ♥ Vera’s nature-inspired designs caught the eye of Schumacher linens and they asked her to design some fabric for them. She worked up several patterns for them in the coming years—including “Jack-in-the-Pulpit,” that was personally chosen by First Lady Bess Truman to decorate the third-floor solarium in the White House, pictured below. ♥ With WWII in full swing and linen supplies dwindling, Vera started hunting for alternative materials. After coming across some parachute silk in an army surplus store, she shifted her attention from linens to silk scarves. ♥ With a foundational belief that that fine art shouldn’t just be for the wealthy, Vera’s designs allowed ladies of all incomes to incorporate beauty into their everyday. They were an instant hit, and she amassed legions of fans, some famous (Grace Kelly, Marilyn Monroe) and most not. ♥ An ever-increasing demand required that the couple move from their apartment to a larger facility. They got out of the city and bought a derelict mansion in Ossing, New York. The couple claimed four of the rooms for themselves and the rest became a studio and printing facility. Soon Vera was cranking out 500-600 designs a year. ♥ Vera expanded into clothing design in 1960. Blouses and dresses were the creative offspring off the textile designs, with the scarves serving as the starting point for every design. Fun fashion fact: Perry Ellis started working for Vera in 1974 as merchandise manager, but soon moved into designing pieces for the line. He worked alongside Vera for three years before launching his own eponymous line. ♥ Other interesting tidbits: Vera put prints on bedsheets before anyone else was. Another innovation? Limiting the number of colors on scarves to three or four to make them more outfit-friendly. ♥ Vera scarves on Etsy range from $7 to $52, depending on how rare the pattern is. It’s also an easy brand to look for at thrifts. My pal Andrea just picked up a mint condition Vera shift from the ’60s for $6 at the Bryn Mawr garage sales a few weekends back. P.S. Click the photos to get to the original sources! This entry was posted in Brand Bias and tagged brand bias, scarves, Vera Neumann by highplainsthrifter. Bookmark the permalink. So I’m reading and loving this post and sighing over Vera’s dreamlike journey when suddenly click! I realize that I OWN A VERA SCARF!!! I have no idea where it came from. A grandmother? A jumble sale? But it just had its first showing in ages on Saturday at the Turf Club for the Bruteheart CD release. So if this is synchronicity, what is the universe trying to tell me? Maybe just that I’m more fortunate than I realized. I feel like a lucky gal to be strutting Vera’s stuff about town. Thanks for the moment of enlightenment! This is a great post! So informative and helpful. 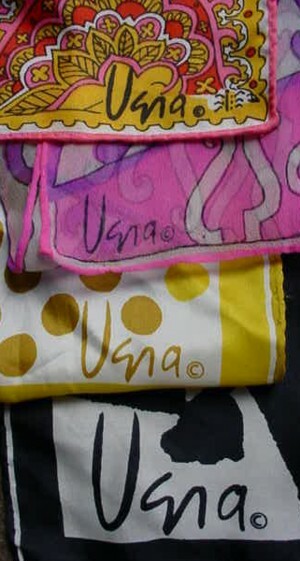 I love Vera scarves and napkins–they are something I ALWAYS pick up at thrift stores.